"This is one of those features that I tell people is in Yahoo! Messenger and they inevitably say, “Really?”. Yes, really! 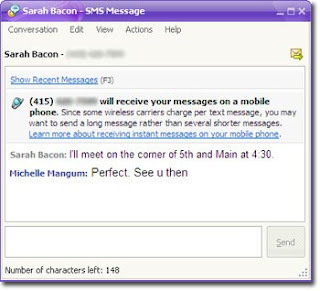 Rather than using your mobile phone to send SMS text messages, you can send them for free from Yahoo! Messenger. When you send an SMS message from Yahoo! Messenger, replies from your friends come back to you in Messenger, making it a quick and convenient way to chat with your friends when they’re not online. This feature is available in all of our versions – 9.0 for Windows, Messenger for Mac, Yahoo! Messenger for the Web, iPhone and even in the chat features in Yahoo! Mail..."